Colin Leggo’s latest video is a spoof of Grand Theft Auto over dubbed with a Cornish accent and aptly named ‘Grand Theft Cornwall’. With over 150,000 hits in just 8 days Col’s done a bleedy ansum job. Check it out, it’s possibly the funniest thing you may see today! Here is a little video I found by Holly Turton – which made me smile! Probably because I fell asleep in that shelter one night in my teens on my long walk back home to Budock Water. Slightly late for Christmas but Happy New Year to all My Saffron Bun readers. Dont forget the Flora Dance is tomorrow, 8th May in Helston Cornwall. One of the oldest pre-Christian Spring rituals still practiced today. This is a great bit of footage of the dance shot in 8mm and 16mm. A more modern day film can be seen here however the tradition is exactly the same. With 101 ‘likes’ in the first six months, over 6000 hits I would like to thank everyone for following My Saffron Bun. My followers are now 123 people and rising so please keep spreading the special recipe of My Saffron Bun to your friends and family. Thank You! Do you ever feel like popping in somewhere warm and welcoming on such a grey and miserable day like today? Well, should you ever find yourself in Penryn you should be sure to make a visit to Miss Peapod’s at Jubilee Wharf. 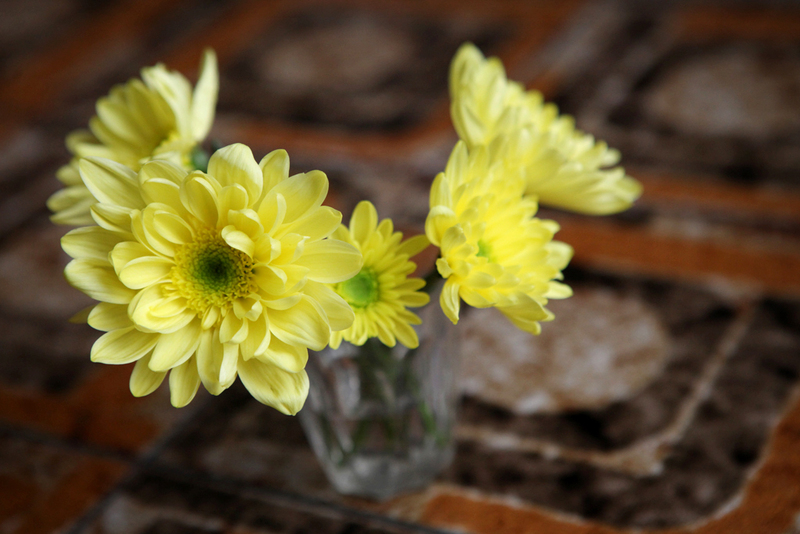 Bright flowers on a retro table will soon cheer you up! Jubilee Wharf is an award winning development with a mixture of housing, workshops, offices and a children’s nursery. Community creation & revitalisation – a hub for craft makers, quality childcare onsite from Jumblies Nursery, health & fitness classes and the café for socialising. It was built on what was the old coal merchants but has extremely green credentials, they have just installed photovoltaic panels and there are 4 x wind turbines on the distinctive shaped roof. 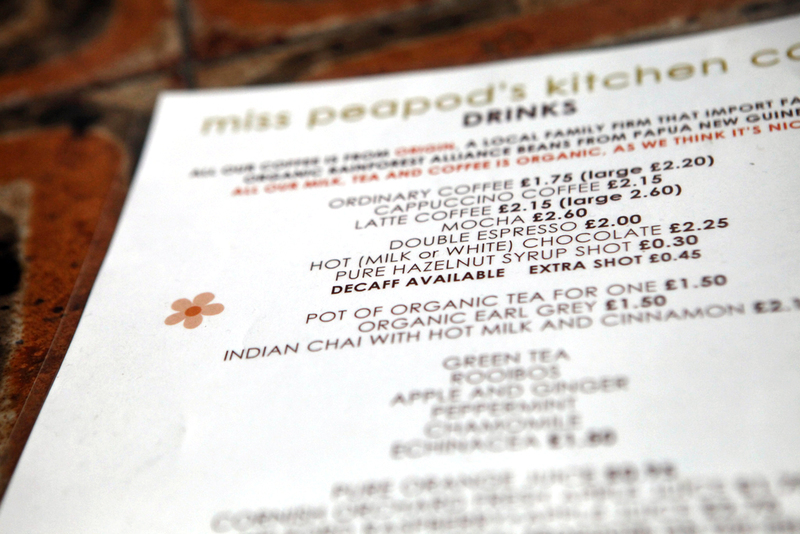 We have only been to Miss Peapod’s for coffee but have plans to go back and eat next time! They make their own pasta and bread and exploit all the seafood brought to them from a local fisherman. Expect specials like crab ravioli and fresh sardines, king prawns grilled in caper, chilli and parsley butter or for people with more simple tastes there are homemade burgers with chips and toasted ciabattas with fillings such as roasted seasonal vegetables and homemade butter bean hummous. 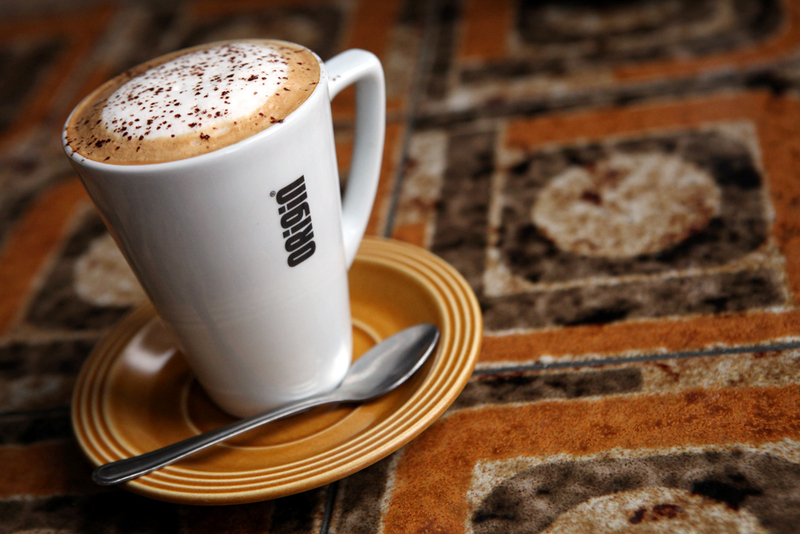 You may notice from the photos that the coffee at Miss Peadpod’s is Origin. Did you know that Origin is a Cornish company? I didn’t! 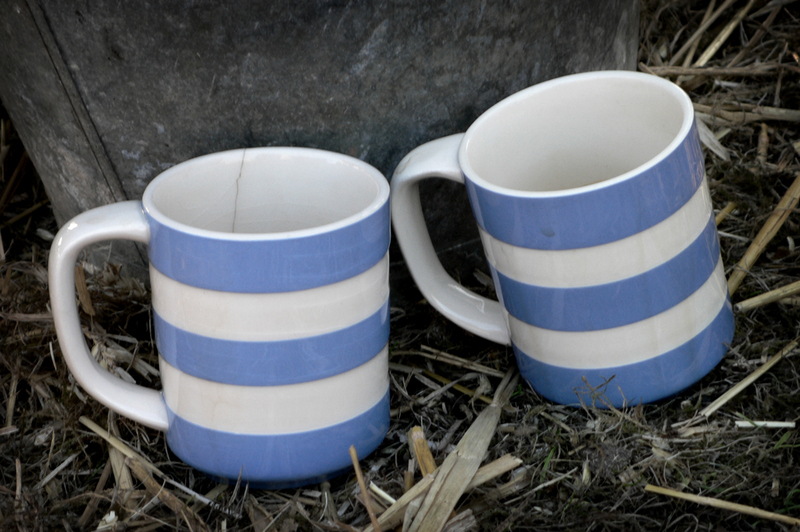 They were established in 2004 and are based in the depths of Cornwall near Helston and they distribute their coffee to restaurants, hotels, delis & cafes in Cornwall and everywhere else. You don’t even need to go down the A30 to try it, we saw on their website their coffee is being used in Malmaison and Hotel du Vin but its a good excuse to nip back to the home county isn’t it? Check their website for more info www.origincoffee.co.uk.